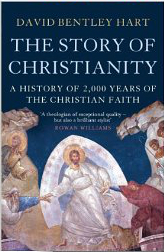 I’ve just read David Bentley Hart’s The Story of Christianity: A History of 2000 Years of the Christian Faith (Quercus, 2013 Kindle edition). I found it really helpful as a well-written summary and introduction to most of the key themes of Christian history in less than 300 pages. Unlike many Protestant historians that I might read, Hart is in the Eastern Orthodox tradition, so he doesn’t just know and tell the story of Christianity’s journey west, but goes east and south as well. He also corrects many of the black myths of Christianity, from the Crusades to the Scopes trial, whilst remaining honest about the church’s many mistakes. Where I found him slightly less charitable was in his treatment of Martin Luther and John Calvin, who are better served by Michael Reeves’ similarly accessible The Unquenchable Flame.